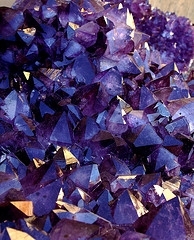 Can you bring an amethyst crystal on an airplane? I have a crystal that I keep in my purse and want to bring it in my carry-on. With all the new rules and regulations I wonder if I will be allowed to bring it on the plane. The rules are at www.tsa.gov – click on “for travelers”. This entry was posted in Crystal Glitz and tagged amethyst, citrine, crystal, crystals, healing on August 17, 2009 by admin.